This election year be summed up into two words…social media. Presidential candidates use social media as free advertising. Instead of using flyers or phone calls, candidates can communicate with millions of voters with a click of a button, especially when followers repost of share on their pages. If you go to any candidates’ social media page, you will find their mission statement, videos and pictures of events, new articles, etc. Candidates use social media to show their support for issues and to clarify statements or rumors. Donald Trump even polled his GOP debate appearance on Twitter! Snapchat, a video messaging application, was not popular during the 2012 election. 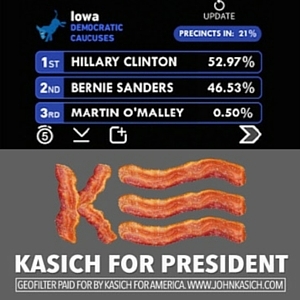 However, candidates like Hillary Clinton and Bernie Sanders use the app, providing an inside look to their daily lives. Snapchat also provides political filters and Live Stories for election, debate and other important days. I particular filter I enjoyed was the updated primary results; each candidate’s voter percentage was listed and updated until the vote was complete. 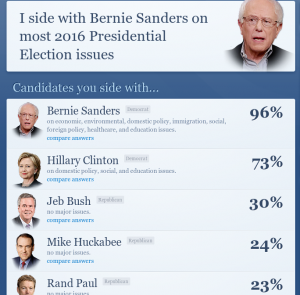 People who are unsure of which candidate to vote for should go to ISideWith.com. Voters state their opinion on issues like foreign policy and education and are matched with a candidate who has the same stance. The site also shows your matches to other candidates, political parties, your ideologies and other interesting information. I thought the website was very helpful because when I watched the debates, I did not know what issues they talked about. The quiz explains what each issue is about so you are not taking the test blindly. It also helped me figure out where I stand on certain issues. My experience with the 2016 election was encouraged by my professor. For my semester project, my class had to experience the debates in many ways; through television or live streaming, a social networking site, talking to a friend, etc. Our observations had to be recorded two days after the debate in order to not be influenced by outside sources. The best way to watch the debates is by online stream or television. When I experienced the debates through social media, I was often distracted waiting for the next tweet or post. When I watched live, I could not be distracted or I would miss important information. I also gleaned information about the candidates personality and idealogical stance. It was hard to find a person or news station on social media that, instead of commentary on some topic I had no context for, posted what was exactly being talked about. Social media can either help or hurt a candidate’s campaign. They have to know how to use it properly and for the right reasons. And, in today’s society, if they figure out the best strategy, they could have the best shot at wining.